The Scout movement had already gained the public sympathy and was widely accepted as a national and pedagogical institution. There even were some initial donations from Greeks abroad in order to get on with the needs. In support of those donations, came the offering of Prime Minister Eleftherios Venizelos (that was sent to him by Greeks in Egypt to spend at will), in the significant (for that time) amount of 8,355.20 drachmas. In 1914 and 1915, more, even bigger donations followed that first by Venizelos. His last donation came with a fotograph of himself and an simple inscription about to become an indefeasible part of the Hellenic Scout emlem: "To the Boy Scouts of Greece, Aien Aristeuein" (Aien Aristeuein: greek for Always Excel). That wish -along with the "Be Prepared" motto- accompanies the emblem of the Boy Scouts of Greece ever since. Due to that generosity, the establishment of Boy Scout Troops in the island of Crete (homeland of Venizelos) and other greek provinces began. The first camp took place on June 1912 at the Magkoufana forest, next to Marousi, Athens. Those grand annual camps were carried on regularly. Year by year the number of campers increased; organization and gear improved and the camps started spreading in more and more provincial regions. We must highlight the fact that the camps of the Boy Scouts of Greece served as models for the camps of other youth and provision organizations that were later formed. Moreover, for many years those camps occupied scout staff to operate and manage their camps. In May 1914, the first public demonstration of the Boy Scouts of Greece took place at the Panathenaiko Stadeum, before the Greek Prime Minister, the authorities and 20,000 people that applauded the Greek Scouts. The box-office was offered to the fighters and the victims of the North Epirus battle. During that demonstration, the first appearance of Greek Girl Scouts also took place. The first Girl Scout Troops were formed at the H. Konstantinidou Lyceum, Athems in 1913. The "Soma Ellinidon Proskopon" (Girl Scouts of Greece) was officially founded in 1915 as a part of Boy Scouts of Greece and was initially under it's supervision. It discontinued its operation next year (1916) in order to reestablish itself as a SEP-independent movement, an act to actually happen 16 years later. In 1932, "Girl Guides of Greece" are established to continue the scouting tradition among the young girls of Greece. Years were passing and Hellenic Scouting was spreading in all the country in a rather slow pace and lacking a big, experienced staff. The Scoutmaster Training Program is then established in Athens and the polymorph activities of the Greek Boy Scouts are growing. 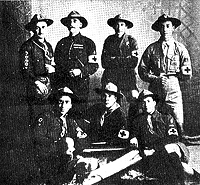 In 1916, the Scouts establish the "Male-Nurse Aides and Orderly Corps of the Hellenic Red Cross". The Scouts offer valuable services during the Corfu cholera epidemic and at the conflicts with allied forces of November 1916. During the 1917 catastrophic fire of Thessaloniki, Scouts of the local Troops showed heroism and self-sacrifice as they run at once near the conflagrant districts and, risking their lifes, drew the victims and the ammunition out of the flames and offered first aid. After a while, 120 Boy Scouts arrived from Athens and Pireas took care of the nursing, catering, collecting of the victims, even the clearing of the ruins with unimagined eagerness and endurance. Scouts from Athens in help of the fire victims of Thessaloniki. At the Macedonia battlefront, Boy Scouts were serving as orderly and escorted the victims to the hospital. Greek Sea Scouts serve as coastguardmen in the defense of Saronikos's Bay. For these services, the Flag of Boy Scouts of Greece was awarded with the Inter-Allied Medal of Victory. In the meantime, the operation of SEP (Boy Scouts of Grece) in the capital and the province is being completed legislatively and administratively. The "Vouli ton Ellinon" (Hellenic Parliament) votes for the Basic Articles of SEP (Law 1066/1917). Scouts are used in the population census, in charity fund-raisers, they are always at the State's side and help in every act that the political and military authorities trust them with. In 1919, K. Melas makes the first attempt of establishing the Cub Scout idea under the name "Trainee Scouts" for children 8-11 years old. The attempt is interupted a year later and them resumed in 1922 at Cairo by D. Solomonidis and in 1931 at Athens by Al. Saratsoglou. 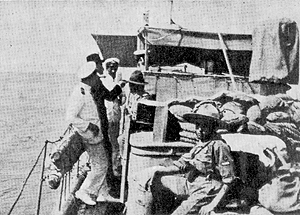 The catastrophic earthquake of April 1929 at Korinth, found the Boy Scouts at the authorities' next to the Hellenic Red Cross for the rescue and nursing of the victims. To acknowledge these services, the Hellenic Red Cross awarded SEP's Flag with a special medal. The Greek Boy Scouts also offered precious duties during the earthquakes that hit the habitants of Xalkidiki region, in 1933.